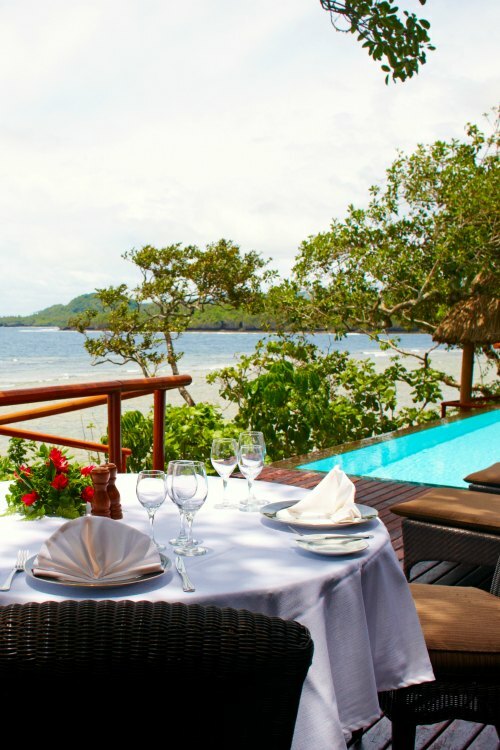 Namale puts typical all-inclusive dining in Fiji to rest in favor of sophisticated, elegant, five-star Fiji cuisine inspired by the rich flavors and traditions of the islands. Serving up daily rotating full service breakfasts, three-course lunches, and five-course dinners, our world-class culinary staff sources the freshest ingredients from our very own organic farm and local seafood markets. Enjoy fantastic meals in our two gorgeous open-air restaurants with ocean views, in private quarters, or at romantic locations throughout the resort, such as next to a waterfall or in a candlelit sea cave on the beach. All meals and snacks are included in your stay, as well as all beverages and alcohol, from fresh fruit juices and Fiji water to premium liquor, beer, wine, and spirits. Treat your tastebuds to the unique flavors of Fiji cuisine and the same high standard of quality Namale dedicates to every aspect of your stay. Main Bure restaurant features a large indoor dining room and bar which serves as host to our daily dinners, cocktail hours, and cultural entertainment nights. The sound of the lali drum, a traditional-style drum signaling significant and community events in Fijian culture, lets you know the start of dinner service at Main Bure restaurant. Enjoy your meal in the main dining room, or alfresco on one of the many split-level decks nestled into the cliffs to enjoy the evening ocean breeze. Walu Restaurant is located on the east end of Namale’s grounds and focuses on casual fare for those on the go. 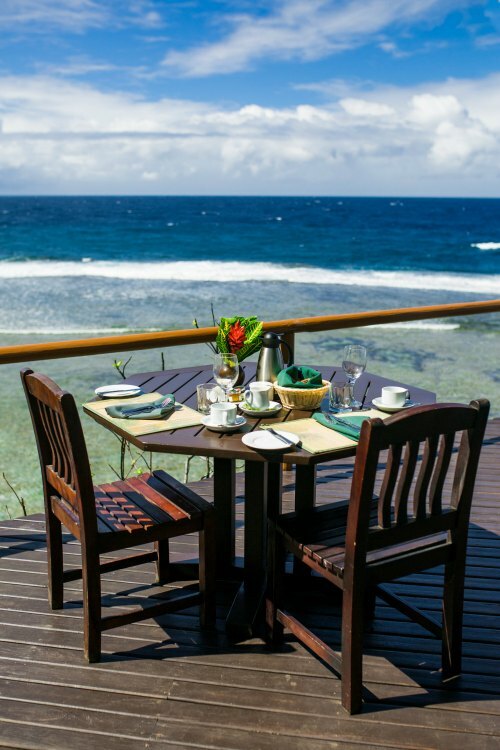 Offering tables in its large, covered dining room as well as Walu Deck overlooking the sea, there’s plenty of space to enjoy quiet meals during your stay. Drop by in between your daily activities for a quick bite, or partake in occasional entertainment held at Walu Restaurant. 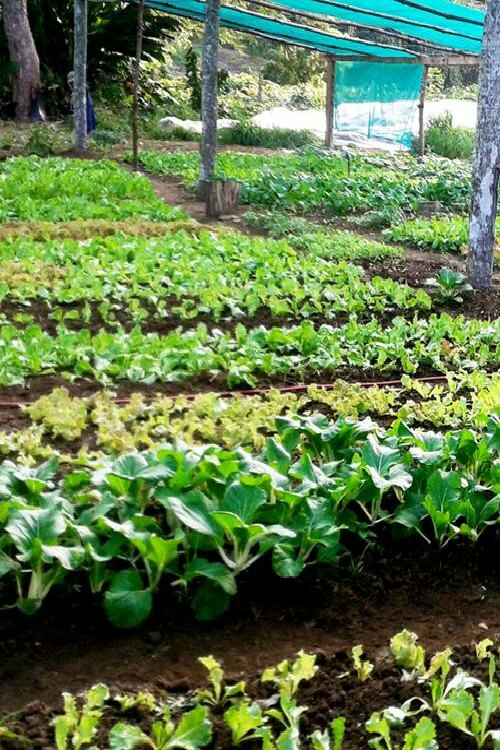 Namale’s Indo-Fijian cuisine focuses on local flavors and ingredients, cultivating its own produce, herbs, and vegetables at its own organic farm. 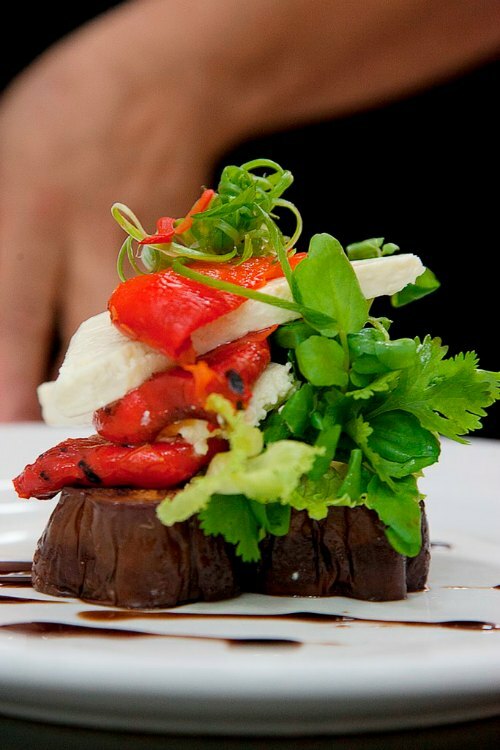 Our talented chefs select the freshest and most quality bounty, incorporating our harvests in everything from main dishes to salads to hors d’oeuvres. Not only does farming allow us to provide an elevated level of dining options for our guests, but it also contributes to a more sustainable and environmentally-friendly Fiji. 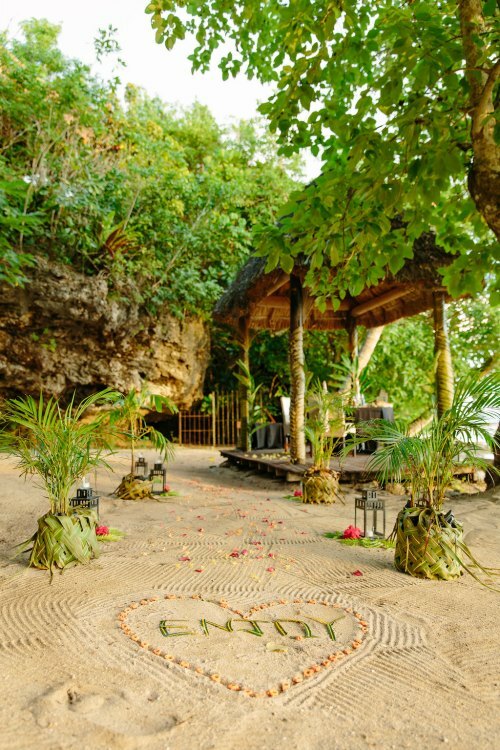 Namale offers the most exclusive private dine-out options for our guests, from ultra-romantic dinners in a candlelit, seaside cave to next to our private waterfall in the rainforest. Enjoy unlimited breakfasts and lunches at unique locations throughout the resort, and one private deck dinner (stays of 1-4 nights) or a lavish, romantic dinner set up (stays of 5+ nights) created just for you – all included as part of your stay. 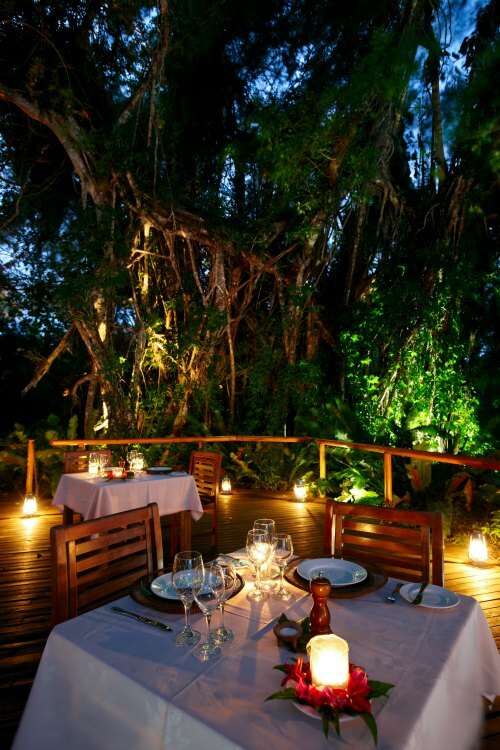 For honeymoons or anniversaries, let us arrange a special meal to celebrate your love at an entirely secret location – an exciting surprise to add to your Namale experience! Other gorgeous dine-out locales include on a hilltop bluff with stunning vistas, right on the beach with your toes in the sand, or on our Veidomoni Deck featuring a romantic heart-shaped hot tub and amazing ocean views. A large part of the Namale dining experience is focused on providing you ultimate flexibility and freedom of choice throughout your entire stay. With a 4-to-1 staff to guest ratio, we’re well equipped to provide you top service when it comes to room service and in-bure dining, or when ordering snacks and drinks poolside, at Kava Bowl, or wherever you choose! Design your menus or special requests in advance, or give our staff a quick ring to let us know your preferences. Let us set up a white tablecloth dinner on your private bure deck for nights you feel like staying in, or have us deliver a pre-dinner cocktail or bottle of wine to your room – it would be our pleasure! Unlimited in-bure dining and room service is included throughout your stay. Namale is committed to accommodating dining options to all types of dietary preferences, whether vegetarian, vegan, gluten-free, certain allergies, or simply preferred flavors and ingredients. We pride ourselves on our ability to tailor your meals to your tastes throughout your entire stay – just simply let us know in advance so we can have everything prepared upon your arrival. Our trained culinary staff will work with you on customizing any or all meals, and is well equipped for special requests that don’t sacrifice taste or elegance. Our goal is to provide you impeccable service and world-class all inclusive dining options to enhance your experience while staying with us. Enjoy rotating menus with an array of options designed by our executive consulting chef, or craft a special carte du jour to your liking. Ranging from delectable, fresh-caught seafood including giant lobster and blue crab to creatively prepared and tender lamb and chicken, Namale’s main courses will take you on a culinary journey through the islands. Accented by fresh, crisp local vegetables and bright citrus flavors, indulge in five-star courses three or more times a day. With a rotating menu designed by a Los Angeles-based executive chef who’s cooked for top restaurants and celebrities, Namale’s dining options set a new standard for excellence in all of Fiji. ★ ★ ★ ★ ★It's been a perfect honeymoon for us! Thank you! ★ ★ ★ ★ ★We have been absolutely blown away by Namale! The feel of this place is amazing, we love it here and intend to come back each year (babysitters permitting). We love the attention to detail and OMG the food! How we will go back to normal is a big question. Thank you to your entire team. We have never felt so welcomed. Perfect for our honeymoon/babymoon. ★ ★ ★ ★ ★We would like to thank everyone who has made our stay so special. We can't wait to tell everyone we've found a secret paradise. ★ ★ ★ ★ ★Everything was fabulous. Overall the staff was amazing. We are so glad we chose Namale - we could not imagine a more perfect honeymoon. Vinaka! ★ ★ ★ ★ ★Everything about Namale was excellent. It was a perfect experience and surpassed all of our expectations. ★ ★ ★ ★ ★We will spend the rest of our lives comparing every vacation experience to our Namale one and we're pretty sure none will ever come close to it. ★ ★ ★ ★ ★Thanks for the best getaway ever! Namale and Fiji are definitely Paradise. ★ ★ ★ ★ ★We loved that we were treated as friends and family…… and not just guests who had paid to be here. ★ ★ ★ ★ ★The customer service here at Namale is by far the best (that we) have ever experienced. The food was impeccable and we absolutely loved our (Villa) Rosi.